It’s a competitive team sport. For a month each year, residents of San Biagio team up to build life-size structures made of local herbs, cereals, and bread. This monumental display is both centuries old and one of Italy’s most fantastical traditions: the Arches of Bread. Every Easter since, residents have teamed up to build towering structures made entirely of locally sourced, organic ingredients. Men, women, and children build the arches with inlaid sugarcanes, willow, wild fennel, and asparagus under the supervision of local artisans. On Good Friday, they decorate the arches with rosemary, which symbolizes grief. And on the night before Easter Sunday, they replace the rosemary twigs with round-shaped bread loaves, chandeliers decorated with dates, mosaics of made of rice and legumes, and marmurata, a sweet, unleavened bread glazed with white icing. Each ingredient takes on a symbolic meaning stemming from Christianity and local farming culture. “Bread symbolises farmers’ hard work,” says Navarra, “but it’s also the symbol of the body of Christ.” Decorations reflect this dual symbolism too: Motifs from local folk traditions—such as the sun, moon, and stars—appear alongside Christian icons such as white doves. A few months before Easter, each team nominates an artistic director whose job is to create an impressive food design. Secrecy is essential, so the planning and building takes place in abandoned warehouses that become food-sculpting labs. Away from prying eyes, each team makes chandeliers from dates, mosaics from barley, legumes, and pasta, and, of course, a varied assortment of bread loaves. Everything gets coated with a natural resin that make the Arches of Bread festival rainproof. 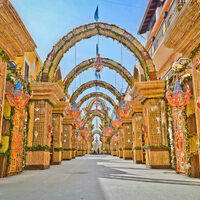 This communal aspect of the festival is what means the most to Navarra, who, together with Giuseppe Savarino, the owner of a popular bar on the main street, has led a local initiative to save the festival from recent financial and political turmoil. Last year, for the first time since the tradition started, San Biagio cancelled its historic Arches of Bread festival due to lack of funds. The town had asked the regional government, which typically provided funding, for an estimated €100,000 that never materialized. While last January, the mayor of San Biagio stepped down after being accused of Mafia ties, which jeopardized this year’s event. Eventually, things turned out for the best. During a heated social media debate about the future of the festival, Navarra came up with a motto: “We surely won’t let the mafia stop the creativity of our people.” Several days later, residents launched a campaign to crowdsource funding and resources. Cafes and restaurants stepped in to sponsor large sculptures; families turned their homes into labs; and many artisans, including Navarra, agreed to build their creations out of pocket.